“Two more meetings of the Hampton Court Meet Committee were held, at one of which it was decided that buglers be appointed to pass the signals down the line of procession, as follows:- Mr. J. Coppin, West Kent B.C., Commandant’s Bugler; Mr. C.W. Nairn, London B.C., Second; and Mr. Wilson, Kingston B.C., Third Bugler. The Hon. Secretary was desired to write to the Railway Companies and state that extra brake accommodation would be required. All arrangements having been duly completed, the third Grand Meet of the Clubs at Hampton Court took place in beautiful weather on May 26th. The Morning Advertiser of the 28th of that month, gives a very interesting account of the event, and from it the following particulars are quoted:- It is stated that no fewer than 41 metropolitan and 27 provincial clubs had signified their intention of being represented, which formed a prospect of something like 1,500 to 2,000 club riders and machines taking part in the procession. As upon the last occasion, the place of honour was assigned to the Pickwick Bicycle Club, and Captain K.M. Yeoman was put in command for the day. Immediately under him were six Marshals: Mr. H. Coppin, Captain of the West Kent B.C. ; Mr. H. Etherington, Hon. Secretary of the Temple B.C. ; Mr. C.J. Fox, jnr., Captain of the North Surrey B.C. ; Mr. H.C. Kearley, Captain of the Royal District B.C. ; Mr. A.W. Lacey, Hon. Secretary of the Kent B.C. ; and Mr. L.C.B. Yeoman, Hon. Secretary of the Pickwick B.C.. Each of the Marshals wore a scarlet sash. At half-past five o’clock the buglers sounded the “advance.” “The Pickwick Club, which was first in order, immediately replied, and the men, mounting at once, came on in pairs in gallant style, amidst tremendous cheering.” The other clubs followed in the order indicated in the following field parade, copied from the official returns handed in by the several corps, with the numbers attending each club. London Clubs:- Pickwick, 69; Surrey, 42; London, 15; Invicta, 17; Wanderers, 46; North Surrey, 24; St. Georg’s, 26; South London Harriers, 14; West Kent, 46; Temple, 92; Royal District, 22; Kent, 19; Crystal Palace District, 11; Stanley, 36; Swifts, 10; East Surrey, 8; Rovers, 13; Moulsey, 16; Trafalgar, 11; Kingston, 24; Ealing, 20; Happy-go-Luckies, 4; Croydon, 11; Harrow, 12; Tower Hamlets, 25; Richmond, 12; Beckenham, 9; Atlanta, 14; Hornsey, 7; Canonbury, 20; Belgrave, 10; North London, 14; Civil Service, 20; Druids, 9; Lombard, 11; Clarence, 9; Athenaeum, 10; Blackheath, 8; Belsize, 10. The following Provincial Clubs were represented:- Brighton, 10; Edinburgh Amateurs, 1; Northampton Star, 1; Maldon, 9; Portsmouth, 12; West Essex, 8; Bath, 11; Northamptonshire, 2; Clifton, 5; Luton Amateurs, 1; Stroud, 1; Northumberland Amateurs, 3; Manchester Amateurs, 7; Redditch and District, 3; Leamington, 3; Buckingham, 1; Ipswich, 1; Chichester and District, 1; Edgborough, 11; Isle of Thanet, 1; Bath Amateurs, 2; Sussex, 6; Littlehampton,2; Kenilworth, 1; Knoll, 7; Stamford, 4; Mellor, 7; West Lancashire, 2; Bristol, 3; Darlington, 1. It took upwards of an hour for the regulars to file past, before the unattached riders brought up the rear. The procession was watched with much interest by H.R.H. Prince Christian and Colonel Maude, C.B., from the windows of the Greyhound Hotel. 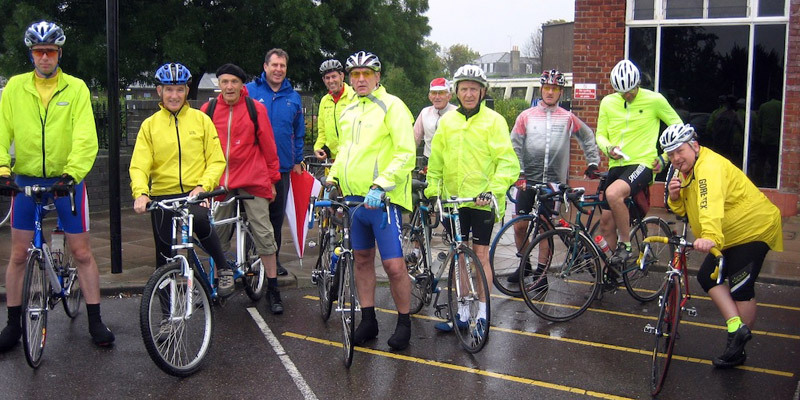 TO-MORROW the great Annual Bicycle Show will take place on the pretty plains about Hampton Court, Fulwell and Teddington. It is expected that thousands of riders will take part in the procession, and if the day be fine, even spectators uninterested in bicycling will witness a sight to warm their hearts. The head of the column of clubs is to be stationed a short distance on the Kingston side of the Lion Gates, and the different bodies of men will, prior to the start, occupy positions between that point and the Teddington end of Sandy Lane. Unattached riders – or, as they are called, non-clubmen – will be berthed on Hampton Court Green until the procession has passed, when it is intended they shall follow in the wake of clubmen. The route is, we believe, as follows:- From Hampton Court past the Green to Hampton leaving the church on the left, along the road towards New Hampton, leaving the old route, turning off to the left and riding nearly to the village of Hanworth. Then to the right, along the Twickenham Road, and to the right again, joining the old route near Fulwell station; thence to the “Clarence” at Teddington, and back to Hampton Court through the avenue. A painstaking committee has done everything that could be done to insure success, and the police authorities have promised that an adequate force shall be upon the ground both within and without the park. There is to be a volunteer review in the park during the afternoon, but we understand the pinion of the authorities is that the cavalry and infantry will not clash. Still it must be admitted that the combination of events is unfortunate, particularly as the chestnuts are just now extremely attractive. The Committee have, however, the satisfaction of knowing that they have deserved to succeed, and although it is not in them to command success, we sincerely trust they may obtain it. The marshals appointed for this day, and from whom information may be obtained are Messrs. F. Honeywell, Surrey BC; L C Baerman and JW Benningfield, Pickwick BC; H Coppin, West Kent BC; M D Rucker, London BC; J R Airey, Stanley BC; O J Fox, North Surrey BC; W Denny, Wanderers BC: Thompson, Civil Service BC; H E Kearley, Royal District BC; H Short, Rovers BC; C W Pagan, Temple BC; A VW Lacy, Kent BC; Clew, West Kent BC; K M Yeoman, C H Larette, S Fussell and C T Scivener Pickwick BC; A Wright, Kingston BC; Stafford, Belgrave BC; and Yorke, J Zingari. 1. The clubs to be massed in the road extending: from about 250 yards from the Lion gates towards Kingston Bridge, in blocks numbered and arranged in order of precedence. 2. No bicyclists will be allowed to pass through Bushy Park on taking up positions at the rendezvous. Clubs arriving by way of Teddington must proceed to their blocks via Sandy Lane. Those arriving via Hampton must pass down the road from the Lion gates to Kingston Bridge. 3. On the arrival of your club you will conduct it to the block the number of which will be forwarded to you in the course of a day or two, when you will dismount and pile machines in pairs facing Hampton. 5. The start will be at five o’clock sharp. Assembly – on the sounding of the assembly at 4.45pm, you must fall in sharp and close up to the club in your immediate front, when you will at once prepare your parade state attached hereto for the marshal, who will ride past to collect the name. Attention – Attention, or prepare to mount, will be on the occasion one G, when you must hand the parade state to the marshal appointed, and your men be prepared to mount in pairs. Advance – Advance will be sounded at 5pm sharp, when the first two men of the leading club will mount together, those in the rear will gradually advance on foot so as not to lose distance and mount in succession of pairs, keeping three yards distance between each pair of riders, and not more than twenty yards between each club. 6. The route will be past the Lion gates and Hampton Green through Hampton (Church Street), to the left (just before reaching Pantile Bridge) towards Hanworth, sharp to the right, passing Glebe Farm, to the right, crossing main road to Hampton, through South Road, to the right, through Main Road, Teddington, past the “Clarence Arms”, through Park Road into Bushy Park and along Chestnut Avenue; the clubs, after circling the Diana Fountain, and passing through Bushy Park gates, will file off to right or left according to their destinations. In order to prevent obstruction and confusion, no club can dismount at the Bushy Park gates, but must proceed either past Hampton Green towards Hampton, or towards Kingston, to points (about half-a-mile from the Lion gates) marked by red flags. 7. Certain buglers will be appointed for the day who will be stationed at different parts of the line. All orders given at the Lion gates to be repeated by them once only. No other bugling will be allowed under any circumstances whatever. 8. Members of clubs out of uniform must fall in with the non-club men, if riding in procession, as no rider will be allowed to ride with any club unless in uniform. You are requested to see this order strictly carried out. 9. Captains will be required to wear their club colours on the left arm, just above the elbow. 10. With a view of preventing accidents or obstructions, all riders are particularly requested to ride machines that can be easily mounted and dismounted, and on no account to ride about after having once fallen in. 11. The marshals appointed for the day will be advertised in bicycling papers, and will take their instructions from Mr H Coppin. Non-clubmen are cordially invited to attend the monster meet at Hampton Court on Saturday, May 18, and in order that they may have a good view of the procession, arrangements have been made for the use of Hampton Green, kindly placed at the disposal of the committee by Mr Ive, and on which the riders not in club uniform and non-clubmen will form up in columns, under H E Sherington, assisted by other marshals. They will then join in at the rear of the procession of clubs, and go over the route with the clubs. On the return journey all riders are urgently requested to ride up to the points marked by red flags, one on the road to Hampton, and the other towards Kingston, both points to be about half a mile from the Lion gates. They are also requested to muster on the Green as early as possible, and to note particularly that after 4.30 no riders can go up the ranks to the Green, but must fall in the rear of the clubs, and thus lose the view. No riders will be allowed to ride from the Green to Kingston until after the procession is off the ground. It is to be definitely understood that riders cannot pass through Bushey Park on taking up positions, and those arriving by way of Teddington must pass through Sandy Lane. LAMARTINE C B YEOMAN (SERJEANT BUZFUZ) Hon. Sec. Before concluding, this article on clubs, we must not omit to mention the great gathering of metropolitan clubs which takes place annually at Hampton Court. 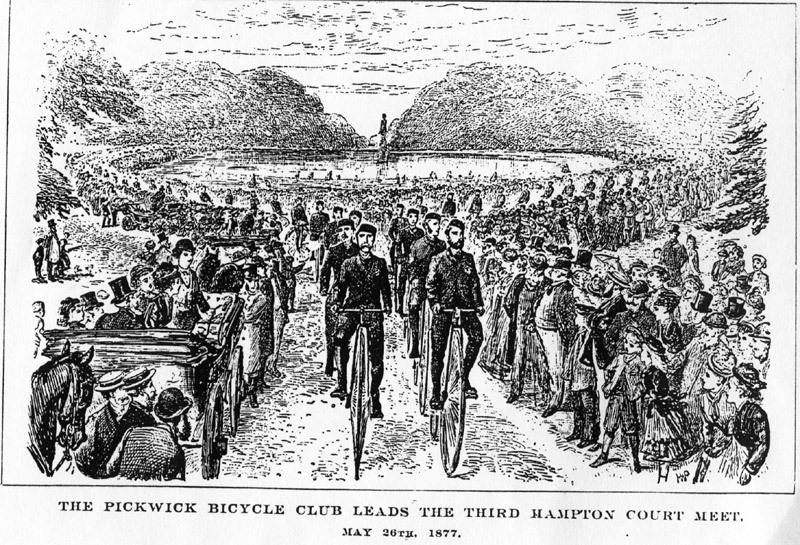 In 1876 some thirty or forty riders gathered together, and rode in procession through Bushey Park. In 1877 the number had increased to 300. Last year it is estimated there were over 2,000 riders present. The meet is arranged to take place this year on May 22nd at 5pm, when probably a still greater number of bicyclists may be expected to be present. …………. 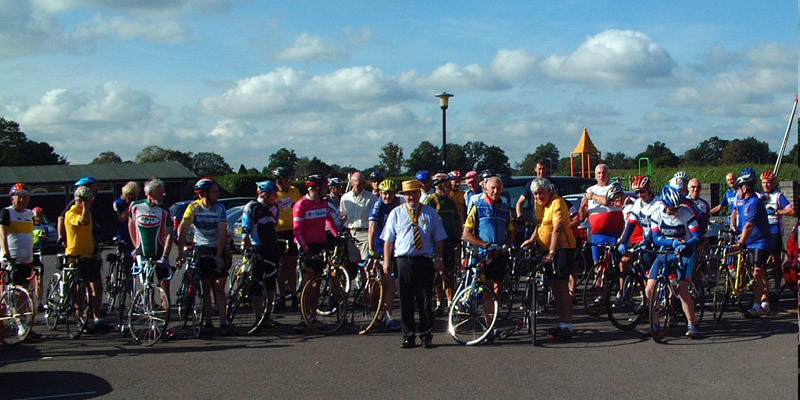 Seven years ago, at Hampton Court, the first Bicycle Meet brought together only 37 men; on the Saturday before the Ealing assemblage they numbered 2,500! The seven labelled posts at Ealing Common were represented by 160 at Hampton Green, and there were in the bicycle programme 122 London clubs and 38 country clubs, as against the Ealing seven. The weather, as it always is on the occasion, was splendid, and the scene at the rendezvous as the clubs came on to the ground was one to be remembered. The bright machines and the crowd of varied uniforms made up a most charming effect. Men had ridden up there from Portsmouth and from Dewsbury, from Bristol and from Herne Bay, from Fareham and from Farnham, from Dorking and from Reading, from Northampton and from Bury St Edmunds. But the locality is not well chosen, nor is the route, to show the numbers at their best. Off the green they went about in fair order, 1,400 London clubmen, the ancient Pickwicks at their head, through Hampton, Teddington, into Bushey Park, down between the chestnut trees, passing the fountain on the left, and out away to Hampton Wick. Many of the clubs were well and deservedly cheered, but the lions share of applause fell to about a dozen black men in full canonicals – burnt cork, wigs, cottons, and all complete. Brudder Bones and Bisder Johnson, and their “cullard” friends, went by in great form, and none did better; the spacing was perfect, the line exact. It was a long procession, and fairly managed, but the bicyclists with such means should make a better show. They want massing; above all things, they should not straggle, and they should all be visible at once. They have a perfect machine, most of them ride it to perfection; why not show it off to perfection!